Remember the magic mirror in Snow White that talked back to the queen and told her she’d been eclipsed by a younger beauty with firmer skin? Well, you can now buy one of your own talking mirrors. 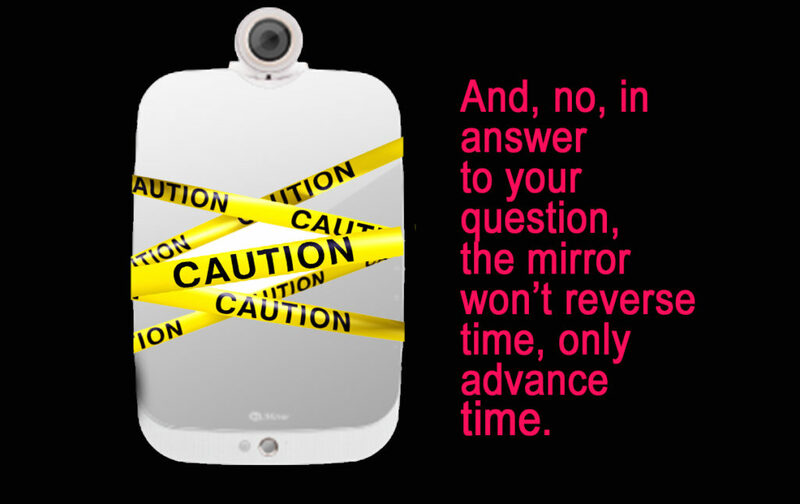 It’s called the HiMirror; depending on your age and skin condition, you’ll either love it or loathe it. The mirror will scan your face and tell you in real time what’s wrong with it. Oh, joy. It looks for wrinkles (are we having fun yet?) red spots (check), pores, fine lines (did I miss a few hundred? ), dark circles (check) and brightness levels. The mirror rates each part of your skin on a scale of 100 with 100 being skin perfection. The idea is to track your skin so you can see if the beauty products you are using are helpful and worth the cost or if you would have been better off applying Crisco. As they say on TV—but wait! – there’s more! The mirror also enables you to watch yourself slowly age. Would somebody please stop this fun train? Some really do regard this as a fun train – like the 30-something reviewer who scanned her face, noting that she didn’t mean to brag or anything, but every test zone on her face scored in the high 90s. I’m happy for you, dear. No really. Go have some french fries. Or one of those blooming onions. Naturally one of the most convenient places to hang the mirror, with the built-in internet-connected camera that can store thousands of images, is on the bathroom mirror. A mirror in the bathroom with a camera connected to the internet and a companion phone app. What could possibly go wrong? Personally, I think the bathroom would be a great place for the smart mirror. After I received the results of my face scan and then watched myself slowly age, it would be a short walk back to the bed, where I would collapse in a tech-induced depression. It’s probably just me, but I can think of other things I’d rather spend money on than a mirror that talks to me about every flaw on my face and charts my progress or lack of progress in making improvements. I am quite content with low lights, thank you —and living in delusion. If the talking mirror sounds appealing to you, hold on to your age-defying anti-wrinkle cream, because there’s more good news where this came from. The same company also makes a smart scale. It looks like a plush bath mat and measures not only weight but body fat percentage, body mass index, total body water, skeletal muscle mass, bone mass and basal metabolic rate. Welcome to the hi-tech bathroom – now known in some quarters as the new house of horrors. An “Old West and New West” cartoon shows the “Old West” side with a cowboy holding his hands above his holster, ready to draw. It’s labeled Gunslinger. The “New West” side shows a man in jeans, T-shirt and a bandana with globs of mud in both hands and more globs of mud at his feet. It’s labeled Mudslinger. It would be even funnier if it weren’t so true. We’ve taken mudslinging to new heights. Make that new lows. If you don’t like someone’s stand on an issue these days, start calling them names. Fascist is a popular choice, as are racist and bigot. Liar, moron and homophobe are in the top 10 as well. If none of those do the trick, pull out the big guns – call somebody a Nazi. The smear has become standard operating procedure. Don’t attack the argument; attack the person espousing the argument. And we’re the grown-ups. Well, in name at least. It’s like the entire nation needs a time-out to contemplate incivility. Ronald Reagan and Tip O’Neill went to the mat in vehement disagreement over policy. They often made witty but disparaging comments about one another (name-calling light). Yet at the close of many work days they sat down for drinks together in the White House. Today, opposing factions would be more tempted to throw drinks on one another. Our incivility is all-encompassing – from Wal-Mart brawls to both sides of the political spectrum. Online media outlets are forced to close the comments section on articles due to incivility of readers’ remarks. Someone posts a comment relative to the article. A second poster questions the IQ of the first poster, a third poster slams the second poster for slamming the first poster and it’s a slugfest. On Twitter, you can barroom brawl in 144 characters or less. Incivility shuts guest speakers out of venues on college campuses, places that were once bastions of the free exchange of ideas. Odd, isn’t it? We punish bullying in some quarters but give it free rein in others. Incivility is why some are contemplating discontinuing Town Halls. You can’t have a public forum when nobody can hear what anybody else is saying over the din of rabble rousers. Those who can crank up the volume the most seem to be winning. Or are they? When incivility wins, everybody loses. When incivility becomes standard fare, civil people pull back. They want no part. Mudslinging, hurling insults and vitriol are degrading and embarrassing to all. We don’t have to agree with one another. We don’t even have to like one another. 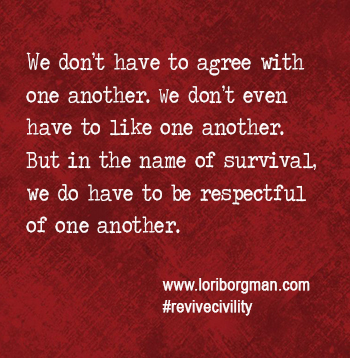 But in the name of survival, we do have to be respectful of one another. When she bounded out of the back of their SUV, they wondered how she would get along with their other dogs, two outside dogs that paced the perimeter of their acreage and sang karaoke at night under a full moon. The outside dogs took immediate notice of the black and tan German Shepherd with the distinct markings and stately stance. They watched her go in and out of the house, something they were never allowed to do. As close as they ever got was inside the garage. They didn’t seem to mind that Casey had special privileges. Maybe they understood. Maybe they sensed that she was there for my nephew, serving as a second set of eyes. Casey was a touch unbridled at first, not always responding to commands, sometimes steering my nephew off course as she explored something that caught her eye. She was curious, full of life and adventure. She didn’t just give my nephew increased mobility; she gave him confidence and courage in a dark world. Shortly after the two joined forces, my nephew had a lot of dental work done. My father sat with Casey in the waiting room as she lunged and pulled, howled and barked and tried to scratch through the wall. The dentist invited Casey back to the treatment room. It was either that or replace drywall. She was never far from her buddy. There was not a restaurant table or enough chair legs to keep her from getting close. Sure, her big paws, long nose and tail might be splayed on four different sets of feet, but she didn’t mind. Nobody else did either. She’s been a fixture at every family celebration from graduations and birthday parties to baby showers. When my dad died, she was there lying in the hallway outside his bedroom door. As the end approached, she lifted her head and let out a long mournful cry. “You speak for all of us, girl,” someone said. For years now, she and my nephew have gone to work every day at a warehouse where people assemble faucets, the sort that go on the outside of your house. Casey rests at his feet, leads him to the break room, back to the work table and out the door when the shift is over. Each night she beds down on the floor beside his bed, but sometime after midnight begins her first patrol. She pads out of his room, down the stairs, through the living room, the kitchen and into the master bedroom where she checks on my brother and his wife. Then she retraces her steps back upstairs and turns into the guest room. You sense someone or something nearby, crack open an eye in the dark and see the big eyes of a German Shepherd inches from your face. She nuzzles in close and waits for a few pats on the back. Finished with patrol, she pads on back to him, her best friend and loyal companion. But now time has gotten the best of her. Her hip is bad. She struggles on stairs. Her sight and hearing are nearly gone. And so it has come time for the inevitable. The day of dread. And now? Well, now it will be like Orville without Wilbur. Casey really was a young man’s best friend.